PARENTS AT KILFINANE Primary School in Co Limerick are blocking the entrance to the school after subcontractors came to remove many of its fittings today claiming they were owed money from the main building contractor. Crowds have gathered outside the school this afternoon after a number of subcontractors began removing shelving and bespoke furniture fittings from the school which has around 140 boy and girl pupils. Principal Siobhan O’Flynn also said that the power has been disabled in the school and emergency lighting is currently being used. She told TheJournal.ie that the contractor had began work on the new national school last March after the contractor before that went bust. The school opened last September but there was a number of snags, according to O’Flynn. She said there had been “rumblings” from some of the subcontractors that they had not been paid but she said that the Department of Education had paid the contractor and there was an issue with the contractor then paying the subcontractors. O’Flynn said: “I did say this to one of the subcontractors that I do understand that they haven’t been paid unfortunately, it doesn’t actually involve us in that we can’t pay them and the money has been paid already by the Department. “There is nothing we can do about it. They should be looking for their money from the contractor. We’re a soft target, the school is a soft target. O’Flynn claimed that one of the subcontractors arrived in the school building after pupils had gone home and let other subcontractors in through one of the fire escape doors. She said they then removed a number of the fittings including most internal doors, shelving in classrooms, doors for cabinets under sinks and furniture in the corridor area. However as subcontractors attempted to leave with the fittings in their vans parents blocked the entrance. Gardaí were on the scene earlier today but have since left. The Department of Education has been informed and O’Flynn says that the school’s solicitor is going to the High Court in an attempt to secure an injunction. According to RTÉ the subcontractors claim they are owed between €15,000 and €20,000 from the DPB construction company in Roscrea in Co Tipperary. Contacted this evening, the company said it would not be commenting. The Department of Education did not immediately have any comment to make. 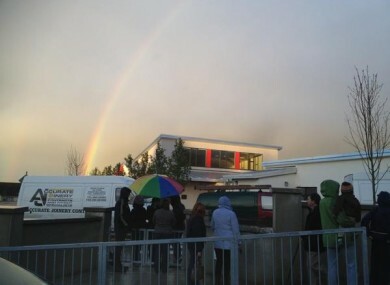 Email “Parents blockade Limerick school after builders remove fittings ”. Feedback on “Parents blockade Limerick school after builders remove fittings ”.